I recently joined the Sewing Circle at Sew Weekly, and I anxiously awaited my first weekly challenge of the year... but nothing popped up until the evening. Nonetheless, the comments on my past projects inspired me to do something about it. And when life gives you lemons (or a citrus-printed fabric! ), you make a skirt, right? 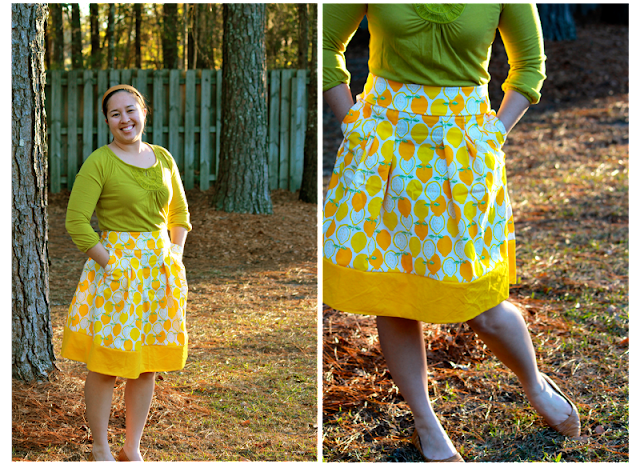 This was my first apparel item with pockets, as well as my first skirt ever. I'll be the first to admit that there are flaws all over the place, it's too tight because I cut it for my size a year ago (hello, New Year's Resolution! ), and the inside is hideous. I didn't understand the directions for the yoke (waist) or the band, so I kind of made things up along the way. But in the end, for three hours of work on an easy day off, I'm pretty happy. I definitely feel like I'm back in the (sewing) game! In other news, so long as I can keep up, I am a registered contributor on The Sew Weekly! I'll be posting most of my sewing projects there, but I will post photos/links here once they are published. Check out my introduction post. I changed out of PJs just to take these photos... no makeup either. Duchess Catherine does it again! What? I haven't been blogging?